Picked this up when I picked up that Strangers in Paradise set the other day. It’s a pretty brief read, so not as much to say about this one. It’s an interesting sci-fi thriller, which is quite a departure from SiP, but it’s a much shorter story and it suffers a little from it, particularly in the ending where you can see many signs that the story was not intended to end this quickly. Plot threads are left dangling, character arcs don’t quite finish, and the ending is a bit quick and abrupt. It’s still an above average story, but that semi-incomplete feeling it has once you’ve finished, keeps it from reaching the heights of SiP. The characters never manage to feel quite as interesting as they did in SiP either, but then again, it’s a pretty different kind of story, with a lot more focus on action, intrigue, and science than heavy character drama. The plot revolves around a woman who suddenly finds herself in possession of a secret experimental alloy…or is it in possession of her? DUM DUM DUMMMMMM! She ends up on the run from scientists, the military, and another mysterious person who has the same science-alloy powers. It all sounds very much like a superhero origin story, yet never really crosses the line into that territory somehow. It lands in a weird place somewhere between superheroes, hard sci-fi, and character drama, but never quite fully qualifying for any single one of them. This is not necessarily a bad thing, but it may not be for everyone. Definitely give it a try if you’re already familiar with Terry Moore’s style though, but…if you are, you probably have already read this. 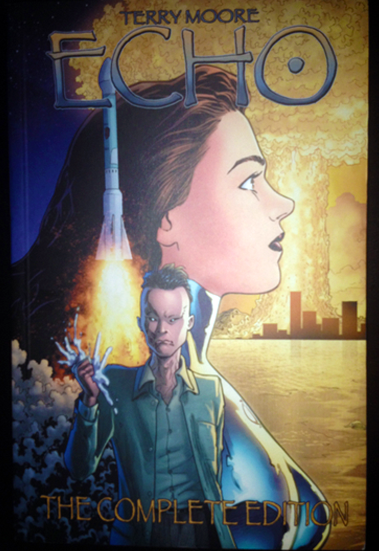 This entry was posted in Comics and tagged abstract, Comics, echo, terry moore.